As all California antitrust lawyers know, California’s principal antitrust statute is the Cartwright Act.1 The Act “generally outlaws any combinations or agreements which restrain trade or competition or which fix or control prices.”2 And, as the California Supreme Court recently made clear, “[f]rom its inception, [the Act] has always been focused on the punishment of violators for the larger purpose of promoting free competition. Does the application of California’s antitrust law to Plaintiffs’ claims against Defendants based on purchases that occurred outside California violate the Fourteenth Amendment’s Due Process Clause? No – the required “occurrence or transaction giving rise to the litigation” took place in California as a function of Defendants’ alleged underlying non-trivial incipient anticompetitive conduct leading to the sale of price-fixed goods outside California. As long as the in-state incipient anticompetitive conduct leading to a subsequent price-fixed sale elsewhere is more than de minimus, the application of the Cartwright Act to a plaintiff’s extraterritorial purchases is neither arbitrary nor fundamentally unfair. Because Plaintiffs alleged that they had purchased price-fixed handsets in multiple states other than California, the United States District Court for the Northern District of California granted Defendants’ motion to dismiss the Cartwright Act claims against all Defendants. The district court held that the application of California’s Cartwright Act to Plaintiffs’ antitrust claims – which were predicated entirely upon the purchase of mobile handsets outside of California – violated Defendants’ constitutionally protected due process rights under the Fourteenth Amendment.22 In dismissing the complaint, the district court made clear that, in its view, the location of the “transaction or occurrence” for the purpose of applying a given state’s substantive antitrust law was the state where the purchase was made by a given Plaintiff. The district court, however, granted Plaintiffs leave to amend their complaint to specify each state in which each of the “purchases of price-fixed goods” were made by each Plaintiff.23 This, of course, meant that each Plaintiff was required to segregate each individual transaction on a state-by-state basis, and thereafter assert individualized claims under each of the applicable state antitrust laws, depending upon the state where the sale occurred. In addition, Plaintiffs’ individualized state-by-state remedy would be predicated upon – and limited by – the vagaries of each of the different state’s applicable antitrust law. For example, only 25 states have enacted statutes – known as “Illinois Brick” or “indirect purchaser statutes” – which allow indirect purchasers to recover damages for violations of their antitrust laws, and many indirect purchaser statutes differ in form and remedy.24 And, finally, no claim under the substantively comprehensive Cartwright Act by any Plaintiff would survive dismissal because no purchases were made in California. For these reasons, the district court dismissed Plaintiffs’ amended complaint, but nevertheless certified the dismissal order for immediate appeal under 28 U.S.C. § 1292(b). The Ninth Circuit granted permission to appeal, and then reversed and remanded. 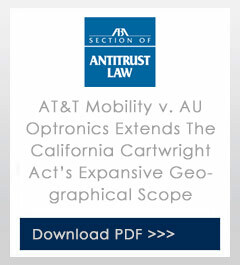 The AT&T Mobility decision holds that the Cartwright Act “can be lawfully applied without violating a defendant’s due process rights when more than a de minimus amount of that defendant’s alleged conspiratorial activity” originates in California, even though the sale of all price-fixed goods occurred elsewhere.32 Implicit in the Ninth Circuit’s opinion is the recognition that the threat to competition – which the Cartwright Act expressly forbids – occurred within California as a function of the Defendants’ alleged anticompetitive conspiratorial conduct.33 The opinion suggests that, in determining whether California’s competition laws apply, the court should go beyond a mere formulaic interpretation of due process rights: the relevant “occurrence or transaction” analysis must include the broad panoply of anticompetitive conduct within the state, including all conspiratorial conduct that is causatively related to the subsequent “event” which gives rise to liability under the Cartwright Act and the UCL. California’s competition laws now apply to a party’s merely incipient – but just somewhat more than “slight or casual” – anticompetitive contacts within California which lead to unlawful transactions anywhere outside California. Plaintiffs now have standing to assert competition claims under the Cartwright Act without regard to “conflicts between the Act and analogous laws in other states.”34 This obviates the practical conundrum presented by a requirement that a plaintiff parse out specific state-by-state price-fixed purchases with corresponding state-by-state antitrust law claims. And it is plausible to suggest that even non-California residents now may seek shelter under the umbrella of California’s Cartwright Act and UCL.35 That represents a “green light” signal to competition lawyers who bring antitrust and unfair competition claims in California courts. 1 Cal. Bus. & Prof. Code §§ 16700-16770. 2 Pac. Gas & Elect. Co. v. County of Stanislaus, 16 Cal. 4th 1143, 1147 (1997). 3 Clayworth v. Pfizer, Inc., 49 Cal. 4th 758, 783 (2010) (emphasis in original) (citations omitted). 4 Union Carbide Corp. v. Superior Court, 36 Cal.3d 15, 20 (1984) (“indirect purchasers are persons ‘injured’ by illegal overcharges passed on to them in the chain of distribution”). See also Clayworth v. Pfizer, Inc., 49 Cal. 4th 758, 782 (2010) (“[r]eviewing the legislative history behind [the enactment of the 1978 amendment to the Cartwright Act], we find indications that the [California] Legislature fully embraced the [Illinois Brick Co. v. Illinois, 431 U.S. 720, 748 (1977)] dissent. . . .”). 5 15 U.S.C. § 1 et seq. 6 Cianci v. Superior Court, 40 Cal. 3d 903, 917-18 (1985) (citations omitted; emphasis in original). 7 J. P. Morgan & Co. v. Superior Court, 113 Cal. App. 4th 195, 221 (2003); Churchill Vill., LLC v. Gen. Elec. Co., 169 F. Supp. 2d 1119, 126 (N.D. Cal. 2000), aff’d, 361 F.3d 566 (9th Cir. 2004). 8 See, e.g., RLH Indus., Inc. v. SBC Commc’ns, Inc., 133 Cal. App. 4th 1277, 1281-82, 1293 (2006). 9 See Id. at 1291 (“We conclude that the commerce clause . . . does not necessarily prohibit state antitrust and unfair competition law from reaching out-of-state anticompetitive practices injuring state residents”); Younger v. Jensen, 26 Cal 3d 397, 405 (1980) (“Neither the Sherman Act nor the federal prohibition of undue burdens on interstate commerce (U.S. Const., art. I, § 8, cl. 3) prevents those state laws from reaching transactions that have interstate aspects but significantly affect state interests.”). 10 Citing Wersheba v. Apple Computer, Inc., 91 Cal. App. 4th 224, 243 (2001); see also, Clothesrigger, Inc. v. GTE Co., 191 Cal. App. 3d 605 (1987). 11 527 F. Supp. 2d 1011 (N.D. Cal. 2007). 12 Antitrust and Unfair Competition Law Section, The State Bar of California, California State Antitrust and Unfair Competition Law, Ch. 1, § 1.01[C] (Cheryl Lee Johnson, ed., Matthew Bender & Co., 2009). 13 707 F.3d 1106 (9th Cir. 2013). 15 15 U.S.C. §§ 1-7. 16 15 U.S.C. §§ 12-27; 29 U.S.C. 52-53. 17 Cal. Bus. & Prof. Code §§ 16700-16770. 18 Cal. Bus. & Prof. Code §§ 17200 et seq. 19 707 F.3d at 1108. 20 Id. The Cartwright Act permits indirect purchasers of price-fixed goods to assert a private cause of action, but many other state antitrust laws do not provide for indirect purchaser standing. Cal. Bus. & Prof. Code § 16750(a); See also, Clayworth v. Pfizer, Inc. 49 Cal. 4th 758, 782-83 (2010). 22 707 F.3d at 1109. There was no issue as to personal jurisdiction over Defendants. Rather, the district court concluded that the application of California’s antitrust law to claims involving the purchase of price-fixed goods outside of California constitutes a violation of Defendants’ due process rights. 24 See ABA Section of Antitrust Law, Antitrust Law Developments at 650-653 (7th ed. 2012). 25 707 F.3d at 1109. 28 707 F.3d at 1107. Not insignificantly, the Ninth Circuit’s decision also applies equally to claims under the UCL, Cal. Bus. & Prof. Code §§ 17200 et seq. 707 F.3d at 1107 n. 1. 29 707 F.3d at 1110. (“Put differently, the district court’s place of purchase rule represents a return to the ‘wooden’ and ‘now largely abandoned’ lex loci delicti doctrine – an approach the plurality explicitly rejected in [Allstate Ins. Co. v. Hague, 449 U.S. 302, 316 n. 22].” Id. at 1111-1112.). 30 707 F.3d at 1110. 31 707 F.3d at 1107. 32 707 F.3d at 1113. 33 The Defendants in AT&T Mobility did not put forth any commerce clause arguments in favor of dismissal. The extraterritorial application of California’s Cartwright Act does necessarily still involve the U.S. Constitution’s Commerce Clause (U.S. Const. art I, § 8, cl. 3) and conflict of laws considerations. But those considerations previously have been addressed by California courts, with predictable results: rarely does the Cartwright Act unreasonably restrain interstate commerce; rather, its application to extraterritorial conduct is consistent with the goal of facilitating competition, not restricting it. See fn. 9, supra; R.E. Spriggs Co. v. Adolph Coors Co., 37 Cal. App. 3d 653, 666 (1974) (“We conclude that where the effect of the application of the Cartwright Act upon interstate commerce is to facilitate competition and not to place a restraint upon it, it is one which conforms with like policies of the federal government, and the state courts have jurisdiction over the subject matter of the action”); Knevelbaard Dairies v. Kraft Foods, Inc., 232 F.3d 979, 994 (9th Cir. 2000) (“California may apply its antitrust and unfair competition statutes consistent with the Commerce Clause”); but cf. Partee v. San Diego Chargers Football Co., 34 Cal. 3d 378, 384-85 (application of the Cartwright Act to interstate activities of professional football would impermissibly burden interstate commerce); J.P. Morgan v. Superior Court, 113 Cal. App. 4th 195 (2003) (putative class action plaintiffs located outside California had insufficient contacts with California to pursue Cartwright Act causes of action). 34 See fn. 12, supra. 35 It also may bear noting that recent California state court validation of the broad interpretation of California’s competition laws has not been limited only to its geographic reach. On January 23, 2013, the Supreme Court of California, in an unprecedented decision, announced that the four-year limitations period applicable to California UCL claims may be modified by the equitable continuous accrual doctrine, which provides that a “series of wrongs or injuries may be viewed as each triggering its own limitations period, such that a suit for relief may be partially time-barred as to older events but timely as to those within the applicable limitations period.” Aryeh v. Canon Business Solutions, Inc., 55 Cal. 4th 1185, 1192, 1196 (2013).